Rockhampton Defence Lawyer Rowan King is the Principal Lawyer at RK Law. Rowan King was born and educated in Wahroonga, New South Wales, where he attended Knox Grammar School. Rowan has a passion and interest in all sport. Rowan had the privilege of playing 1st XV Rugby Union for Knox Grammar, including opportunities to tour and play in England, New Zealand, Canada, and around Australia. Rowan believes his experiences on the football field have influenced his approach to the provision of hard-hitting legal defence, and unwavering support for those on his team. Rowan King’s passion for sport coupled with his desire to serve the community, saw him appointed in 2018 as the Legally Qualified Member of the Central Queensland Judiciary for the AFL, determining charges and sentencing players for misconduct on the Australian Rules football field. Rowan King’s legal career commenced in North Queensland where he was employed as a Law Clerk with Legal Aid Queensland. Rowan King then worked for a number of years with Bottoms English Lawyers in Criminal Defence, Administrative Law and Family Law, including notable cases such as getting his client bail on a Murder charge arising from the Palmer River. Rowan was offered a position with the Queensland Indigenous Family Violence Legal Service where he travelled around Cape York, providing advice and Court representation to survivors of Domestic and Family Violence through Domestic Violence Court and the Family Courts. Rowan left to pursue a career opportunity as a Prosecutor. As a prosecutor, Rowan King dealt with all types of Criminal Law matters, Domestic Violence Matters and ancillary legal matters for the Queensland Police Service. 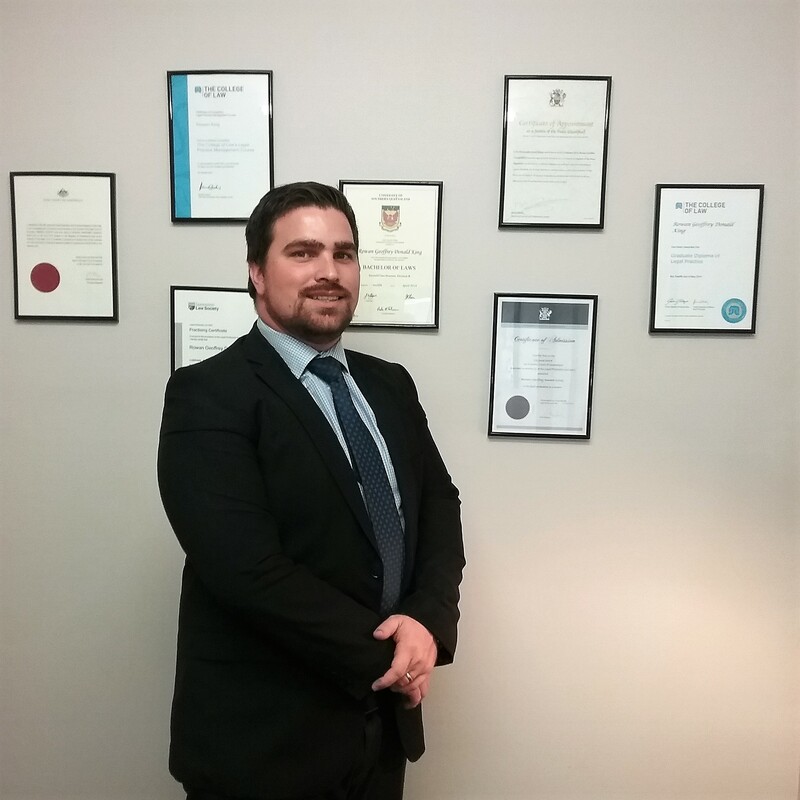 In Late 2016, Rowan King was offered a position to go back to QIFVLS and manage the Central Queensland Branch of the state-wide government legal service working between Brisbane – Mackay and Emerald. Whilst the position was rewarding, his desire was to open his own firm and provide competition to the historic law firms in CQ. In April 2017, Rowan King and sister-in-law Beverly Pinkham opened RK LAW, with the support and encouragement of Rowan’s wife of 8 years, Leonie. With Beverly’s background in Finance, and Rowan’s experience in Law, RK LAW’s owners had the vision to open a law practice that provides fixed fee legal advice and representation to those who are required to attend all courts in Central Queensland. The vision of RK LAW is to provide high quality, ethical, honest and affordable legal advice, whilst ferociously advancing our client’s interests in and out of Court. Rowan King has now entrenched himself in the Rockhampton Community, through his daughter and her school, in addition to volunteering as a Justice of the Peace, as a member of the AFL Judiciary, and as a supporter of the CQ Capras Rugby League Team. Rowan King and RK LAW also provide mentoring opportunities to law students and school students seeking to advance their career in law, by providing Placements, Practical Legal Training and court assistance. Since opening, Rowan King has been called upon to defend clients with high profile local CQ cases. For more information on our cases in the media, click here. ROWAN KING – SHORT C.V.